Our records show that you may have purchased or received the Guide to the Outdoors (GTO) Hybrid Hunting Knife sold by L.L.Bean under item number 296435. L.L.Bean has learned that the knife may cut through the original protective sheath. For your safety, please stop using the knife and sheath immediately. L.L.Bean will provide you with a redesigned sheath with added rivets. Please immediately dispose of the original sheath and begin using you new sheath when received. 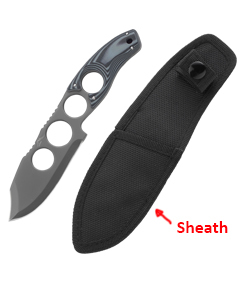 If you purchased this product as a gift, please pass this information along or call us at 800-555-9717 and we will send this letter and replacement sheath to the gift recipient. As always, our 100% Satisfaction Guarantee applies. If you are not satisfied with this product for any reason, please contact us for assistance with returning it for reimbursement. This product recall is being conducted in cooperation with the U.S. Consumer Product Safety Commission. All of us at L.L.Bean are firmly committed to providing our customers with the best products and service. We regret any inconvenience this has caused; however, your safety is most important to us. Please let us know if you have any questions regarding this safety notification.